I love kimchi. This, however, is not real kimchi. 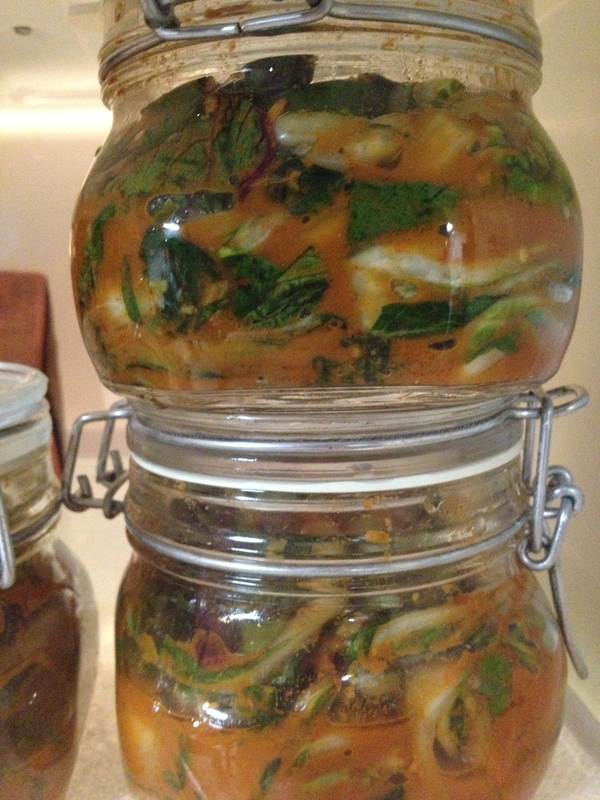 It’s a nod to the spicy, stinky, probiotic goodness and an experiment in using what’s on hand. It’s a riff on my homemade kimchi recipe. We had such a huge harvest list in this week’s CSA that I’m just incorporating the things that would otherwise go to the chickens. And the ladies have enough pasture right now. Remove and wash the leafy veg. Slice the leaves into long strips. Sprinkle with salt and toss. Leave out to wilt on the counter covered for approximately 24 hours. In a food processor, add the garlic, ginger, peppers, soy sauce, and anchovies. Process until it becomes a paste. Toss the paste with the cabbage, scallions, and carrots. For a more pungent flavor, allow this to ferment in a cool place (<68F) in your lactic fermentation crock for approximately 24 hours. Otherwise pack it into sealed glass jars and store in the refrigerator. The kimchi will be ready to eat in as little as 1 day, but is better when it starts to bubble with the probiotic fermentation process. It’ll keep in the refrigerator for months and is a great way to extend the shelf life of veggies. But I know you can pickle crunchy vegetables. Chop up the veg and put them into a clean glass jar. You can recycle an old tomato sauce jar if you have it. Then boil the brine and pour it over them. Add boiling water to top (about 1 cup). Experiment with cut up pieces of beetroot, kohlrabi, green beans, daikon radish, carrots, peppers, cauliflower, and of course, cucumbers. They can be ready to eat by the next day. 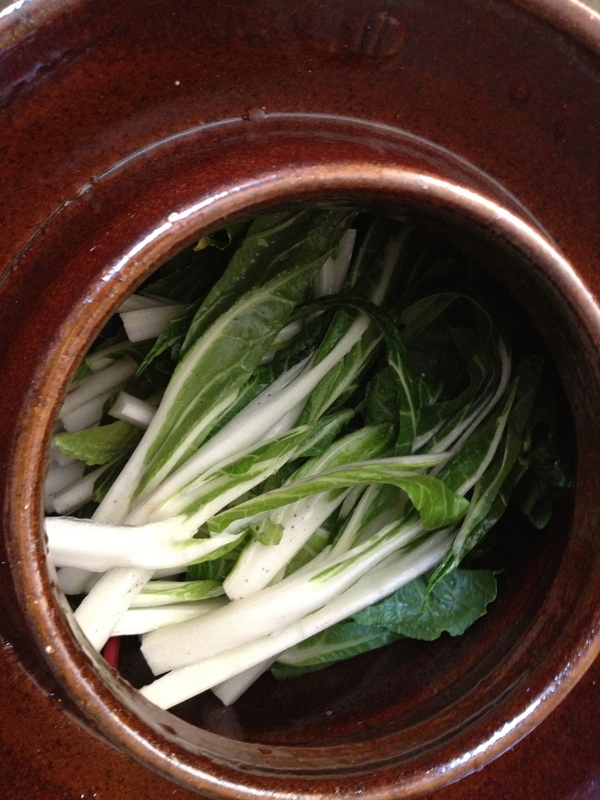 They keep in the refrigerator for months and develop more of the pickling flavor with time. This makes enough brine for 2-24oz. ball jars. 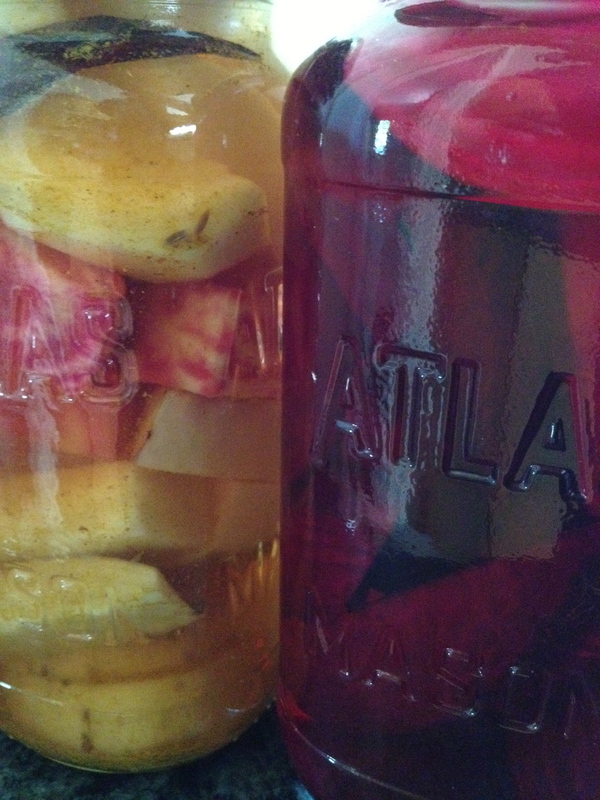 This time I used a red beet and a “candy cane” beet with a hot pepper brine in one jar (right). The other jar (left) is a curried pickle containing a golden beet, a kohlrabi bulb, and a few pieces of the candy candy beet that didn’t fit in the first jar. 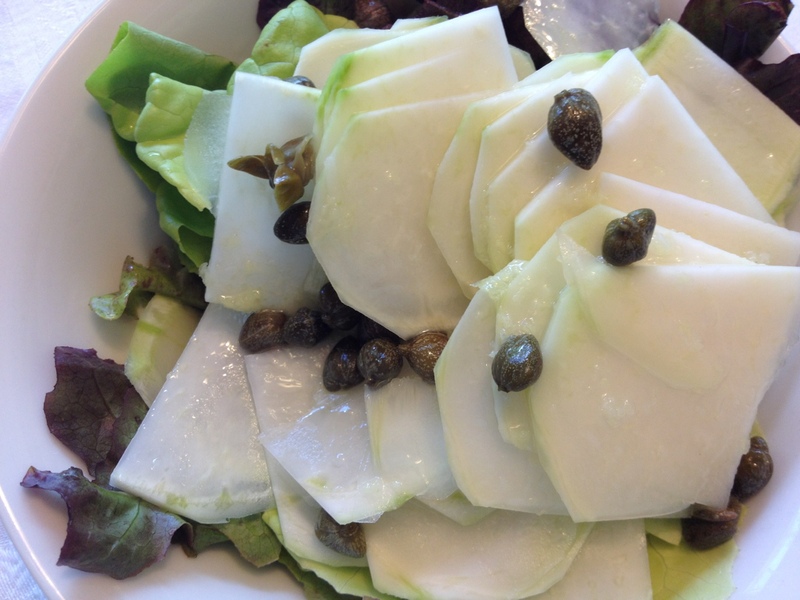 Still looking for kohlrabi inspiration? Me too. 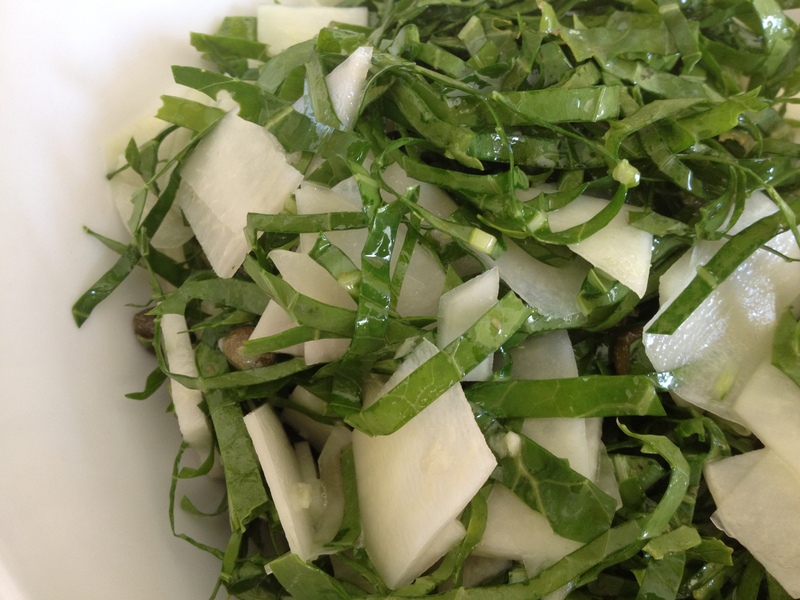 I finally developed a taste for the bulb in my my favorite kohlrabi salad. But the greens? Hmm. Instead of immediately throwing the greens to the chickens, I thought I’d revisit that recipe and see if they can’t be incorporated. Besides, the chickens have enough pasture this time of year and I’m trying to up the brassica (cabbage family) superfoods in my diet. The greens are certainly tougher than delicate lettuces, but they provide a crunchier, coleslaw-like texture to the salad. If you prepare the salad ahead of time, it will give them time to soften in the dressing. I never used to know what to do with Kohlrabi. I’ve tried it baked, grilled, and boiled. Blah. Although I suppose it’s ok roasted with a bunch of other root vegetables, its currently 97F outside and there is no way I’m turning on the oven. Then I discovered it raw in this salad combination. It reminds of the seedless part of a cucumber: Mild, refreshing and crunchy. It’s also quite easy to make as it only requires a quick toss. The vinaigrette is a keeper for a variety of salads… green, pasta, potato. Have you hugged your chicken today? Assa Chourico (Assa Chouriço) or Flaming Sausage! Help! There is Blood Dripping from my Chicken's Beak!